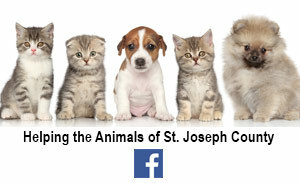 Seats for the St. Joseph County Animal Control Advisory Board were appointed last week. Kristina Eaton, a Burr Oak-area resident, was elected chair while Tracy Parker, from Sturgis Bank and Trust, will serve as co-chair for the year. Parker will also serve as interim secretary. Eaton said the board has two seats open: one citizen-at-large and one marketing coordinator. She expressed optimism that someone from the county will step up to take a seat and especially the responsibility of secretary. Animal control officer Greg Musser will use the agency’s Facebook page to seek potential board members. Eaton said the board would like to move quickly and get new board members before its February meeting.